Most of us have probably seen this image already. Being that I just got my issue of AD, I finally got to devour it in all of its glossy glory and I'm dying. Love the mix of pattern, the pink on the walls with those black door frames, the bold simplicity of those prints, the grounding stripes. And then there's the burl wood tables that make my heart explode into a thousand tiny pieces. Too good. I have been going back and forth between a gray with lavender undertones and a peachy coral for my office at home, and this really makes me lean towards the coral. To quote my husband: "I think we have moved past Johnson County beige." Sassy, right?? Now to get some art on those walls. 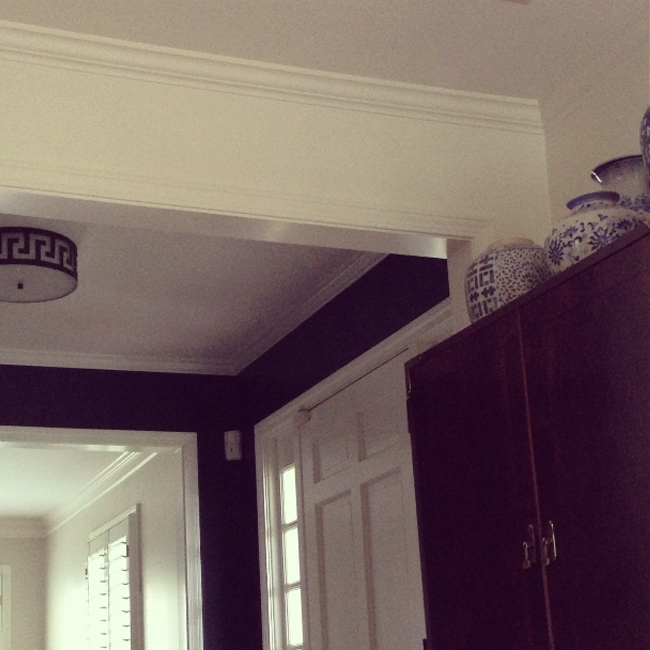 LOVE our new Ballard fixture in the entry, too! Also, if I disappear this week, it's because my dreams came true and I had this baby early. So funny I almost did our nursery a similar shade to Lauren's office. I went with purple gray- anything in the pink family just seemed too girly to me (I am weird I know). Love your entryway color and really love the light fixture would love to put that in our hallway! Isn't it funny how you have grand ideas until the labor begins then suddenly one room seems sufficient? ha! Your entry looks beautiful. Is it black or navy? I'm on the hunt for the perfect navy myself. You are stylin' up Johnson County for sure girl! So loving the color! And good luck - hopefully that baby arrives soon! Oh my gosh, I am laughing at your husband's quote! Johnson county beige HA! Looks fantastic! 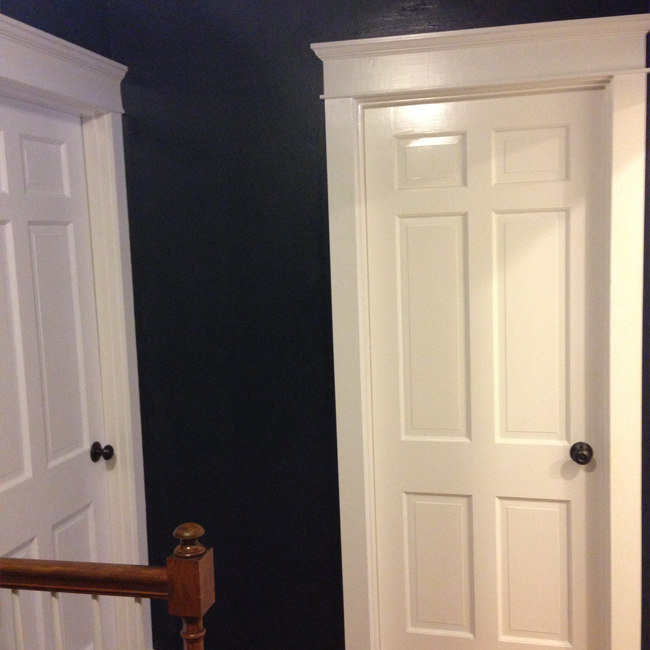 @Dana, it's actually a very dark gray (Benjamin Moore Soot), but it has strong blue undertones and actually does look navy in certain light. I love it! It's looking fantastic! Great color! OH, and here's hoping that baby makes an early appearance. Beautiful, love the blue and white pots as well. LOVE the paint and trim. Best of luck for a smooth and speedy delivery sweetie ! The paint looks fantastic! Have been stalking that fixture for a while but decided to go in another direction. Glad you love it.